Free photos of Yellowstone National Park. A description follows each photo. 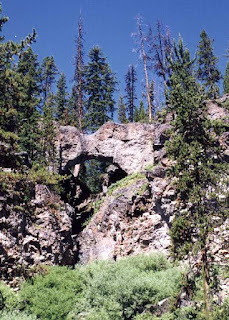 These photos were taken during our visit to Yellowstone in July 2000. 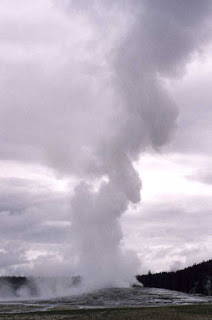 Above: Old Faithful Geyser. 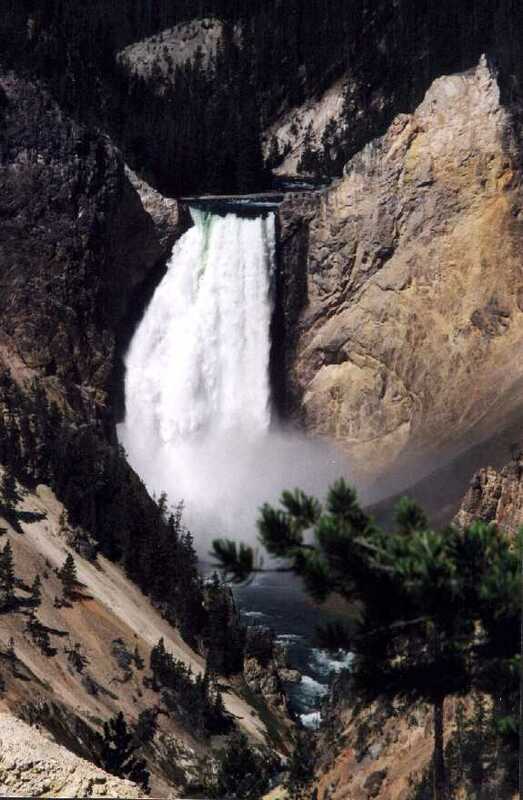 The most famous feature of Yellowstone. Unfortunately a storm came up that day leaving a cloudy background that make the geyser hard to see. We arrived just as it was erupting, so this shot is the tail end of the eruption, mostly steam. Riverside Geyser. 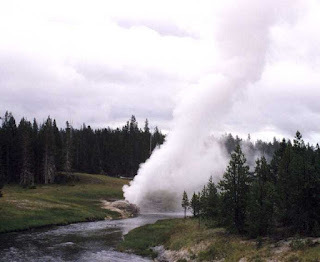 This geyser is right on the edge of the Firehole River (great name for a river in Yellowstone!) and shoots at an angle over it. 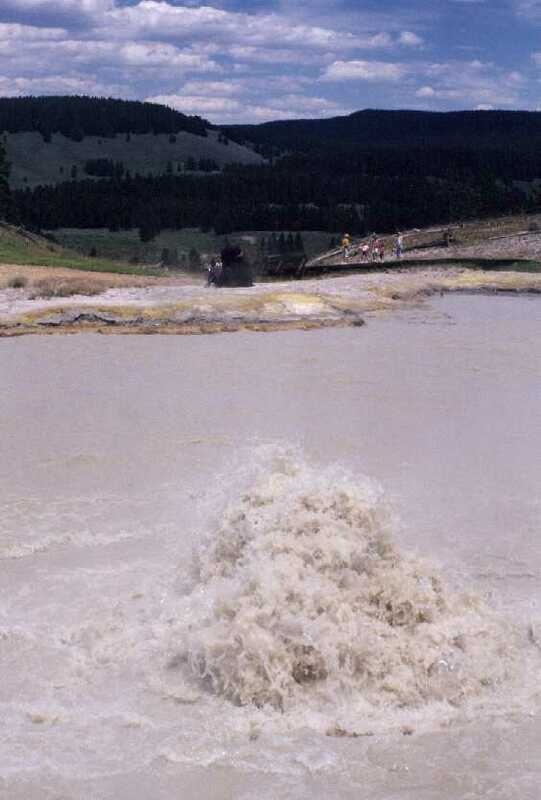 The geysers in Yellowstone tend to go through more or less active periods. At the time of our visit they were less active, so they were not erupting as forcefully as they sometimes do. Welcome to Club Bison. 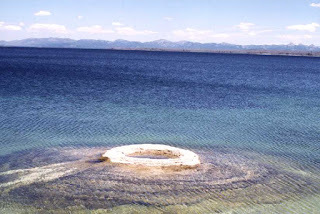 This boiling spring makes for a toasty, natural, "buffalo spa". 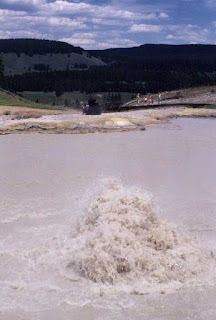 Notice the large bison sitting in the background where the warm steam from the hot spring drifts over him. Ahhhhh.... what a life! 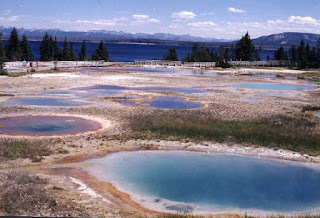 West Thumb Geothermal Area. 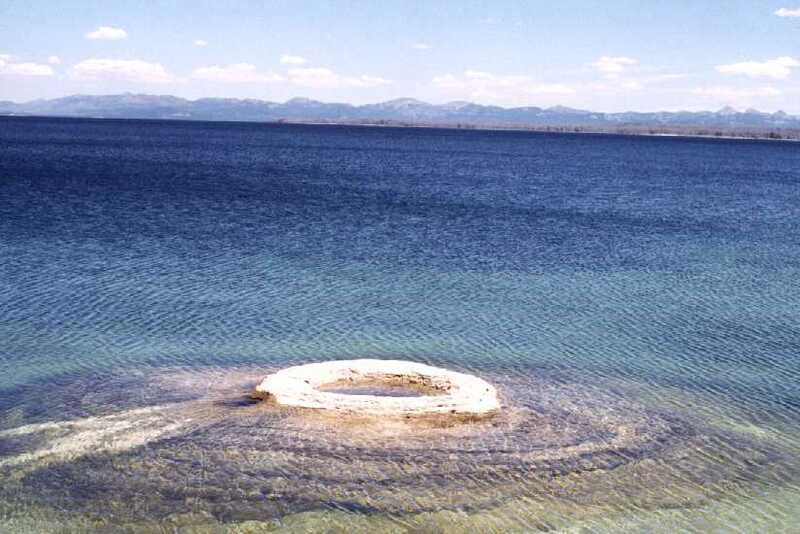 That's Yellowstone Lake in the background. 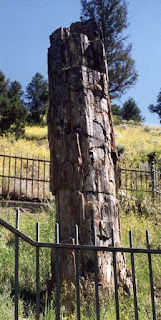 Petrified Tree. The fence around the tree is to keep people from chipping pieces of petrified wood off of the stump. There used to be 3 stumps here. Now only one remains. Perhaps one of your older relatives visited Yellowstone years ago and bought a piece of petrified wood. If so, they may have part of one of the other stumps! Speared Tree. You won't find this or the next item in any of the park literature. I'm always looking for weird trees. This one is in the Grant Village area, along the paved path from Lodge Building "D" to the employee housing area. 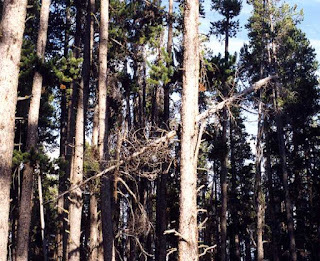 It consists of two trees in an area that burned in the big Yellowstone fires of 1988. The first tree is forked into two trunks. The 2nd tree fell directly between the forks of the first tree and wedged there. 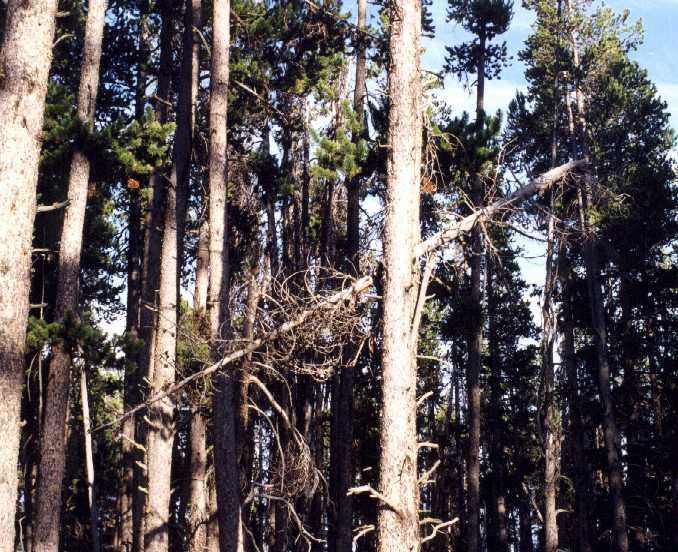 The main part of the 2nd tree's trunk broke off, leaving the top portion of the tree suspended between the forks of the first tree. The resulting appearance is that one tree has been speared by the other. Hugging trees. These two trees were growing very close together. 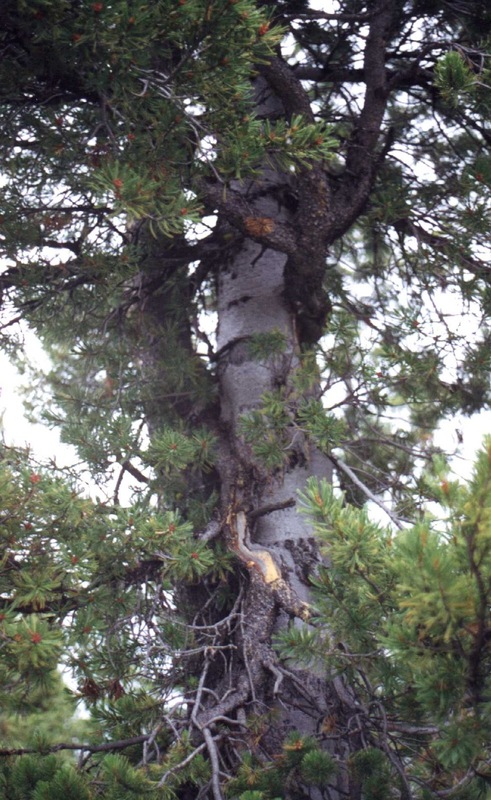 The branches of one tree have grown around the trunk of the other resulting in the appearance that the trees are hugging each other. 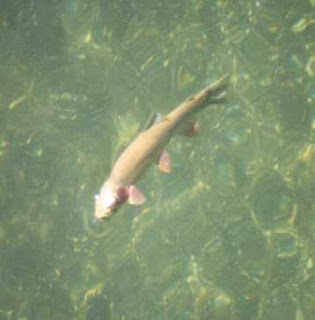 It is located in the Grant Village area on the lake side of the trail that goes from the Grant Village Dining Room to the Lake House Restaurant. 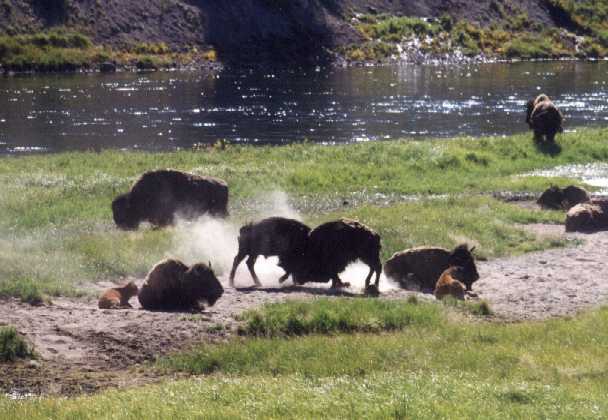 Bison butting heads. These two bison were having a disagreement. Taken in the Hayden Valley along the Yellowstone River. Buffalo (Bison) herd. Hayden Valley. 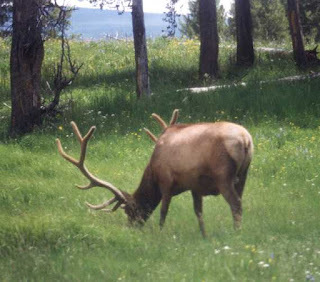 Elk. 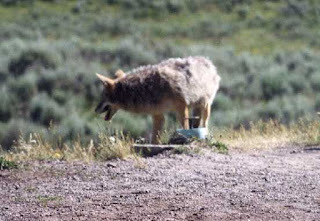 Photo taken near Canyon Village. What, no bear photos? Well, I do have one, but the bear is so far away you can't really see him. I did see 2 adult bears (one black, one grizzly) and one black bear cub playing on a fallen log. But the adults were too far away (even for my zoom lens) and the cub was scared off by a loud mouthed kid before I could get my camera out. Maybe just as well, as where there is a cub there is usually a big nasty mama bear ready to remove your arm! Both adult bears were spotted in the Roosevelt area of the park. The cub was in the Colter Bay area of Grand Teton National Park.